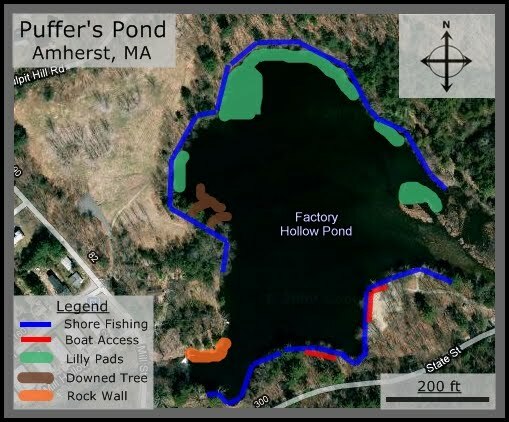 Factory Hollow Pond, known to almost everyone as Puffer's Pond, is a small round pond in Amherst, MA that is known more for trout fishing than bass fishing. There is access to nearly every part of the pond from the shore and if you wanted to you could get a small boat in there as well. The bass I have caught here were pretty small but I only fished here during the post spawn period. Puffers get's pretty deep in the middle, about 15 feet from what I've heard, but the northern shore is pretty shallow and the weeds just off the shore give the fish good structure to hide by. There are lilly pads running along the northern and north eastern shores that you can fish as well as a few downed trees on the western shore. On the south western shore, there is a tall rock wall that goes deep into the water that you can fish if you can cast it far enough out there. I've also seen a few kids fishing from atop the rock but I'm not sure how to get up there or if it's even legal to be up there. For the most part, Puffer's Pond isn't an ideal fishing spot but when you're crunched for time and want to get in a few casts, you could do a lot worse than Puffer's. One thing you have to be aware of though is that this is the "beach" for Umass students. On a hot spring/fall day, expect to see hundreds of students laying on the beach and swimming so don't expect to have a very successful day. Successful Bait: Worms- Watermelon, pumpkin seed green. Poppers- Yellow & Black pattern. As a umass student, I want to tell you that the maximum depth of Puffers pond is more than twenty five feet, and the average depth is between 5 to 8 feet. So.. swimming is dangerous in some area..